How are you this lovely Sunday? This Saturday was just a nice chill day for me! Little Jenny and I went to a really nice breakfast at a Bistro that we love and I had the most yummy breakfast. I wish I took a picture of it to show you. I had an egg white omelet stuffed with veggies, with a side of vanilla yogurt and a yogurt pancake. You can’t have yogurt pancake on the menu and not expect me to get it. I didn’t eat everything, but I ate most of it. After that we took a stroll through the shopping center. They opened a new Neiman Marcus there that we were just dying to see. Lets just say it was window shopping, no buying. I saw the cutest little tan purse that had a gold starfish buckle on it. It was so adorable. The price for that little purse was $325. Believe me I thought about it for like a second and realized I gave up using credit cards, so nope. We walked out empty-handed. I was a good girl! After a little more window shopping, It was already started to get a little to hot out, so we came home. I was so thirsty this afternoon! I think I was pretty dehydrated from all the coffee I had. You know when you’re at a restaurant and they keep filling your cup, well they did, and I kept drinking it! At home we didn’t have any bottles of water and well you know tap water is not that good! We also didn’t have any ice cubes, so I couldn’t even chill the water if I chose tap. So I was thinking what could I have? Than I looked and I saw my personal size watermelon and I thought water, melon, there’s my answer! I made the sweetest little drink that contained no sugar and quenched my thirst. 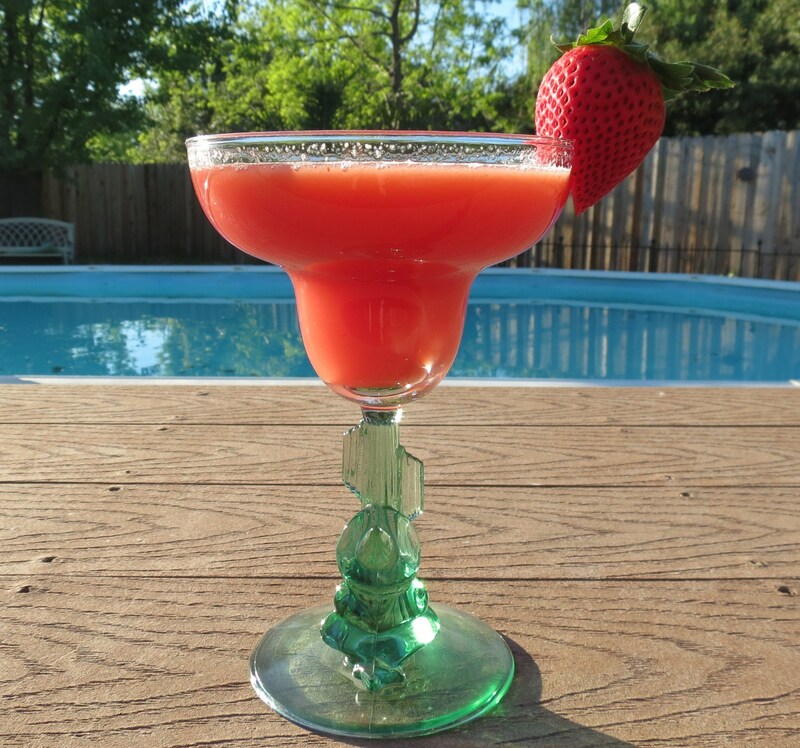 This drink contained watermelon, strawberries, lemon juice and water. I am a total fruit freak and I rarely ever add sugar to my fruit, so if you like things on the sweeter side, I recommend adding either sugar, agave nectar or honey. What surprised me, was the watermelon for this time of year was extremely sweet and now that strawberries are starting to come into season there super juicy and sweet too. Mmmm, strawberries! They just have to be my favorite fruit! My Husband is shocked by how many pints of strawberries I go through a week. My guess is 3 or 4, plus the ones I use frozen. Gosh, I just realized I used the word sweet like a million times, sorry about that! I just can’t think of another word to describe the juicy, delectable, tasty fruit. Some words just fit perfectly, don’t you think? I love Mother Nature! It’s amazing how you can take such simple ingredients and make such a wonderful treat. Now if you wanted to be naughty you could totally turn this into a Margarita. I would add some tequila or vodka to it. Just a shot is needed! Add some crushed ice and you got a party!! I was pretending I was partying by using my margarita glass! 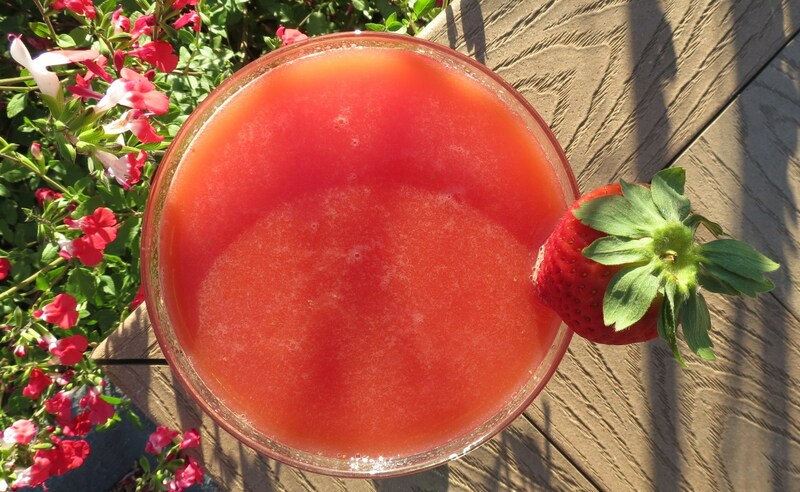 A sweet summery drink made with watermelon and strawberries. Place all ingredients in a blender and process until combined, about 20 - 30 seconds. Optional: To Strain; place a fine mesh sieve over a pitcher or bowl and pour juice into strainer. Using a back of a spoon push juice through. This can be done a few times to make drink clearer. Once juice has been strained you will have about 3 cups. This is what I did. Note the calories maybe less. When I processed the drink it had 4 cups, once I strained it, I was down to 3 cups. So I would imagine the calories would be less. Having this drink was my way of celebrating Earth Day!! All good things from Mother Nature! So I say cheers to the Earth for giving us such wonderful treats. Well my Friends, get out there and enjoy the Earth and what it has to offer to us. For me, it will be getting up early and digging my hands in the dirt and prepping my garden. Have a wonderful Sunday! 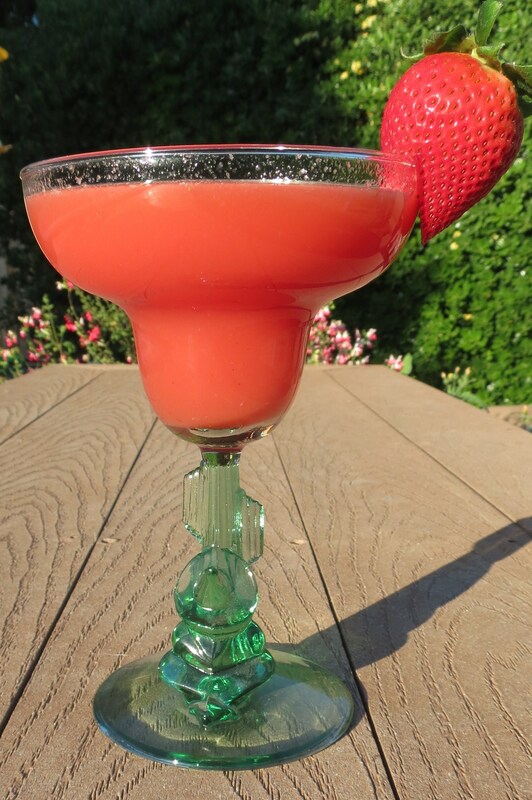 This looks like the perfect summer drink, I also ADORE strawberries and watermelon is close behind! I’ll definitely be trying this! 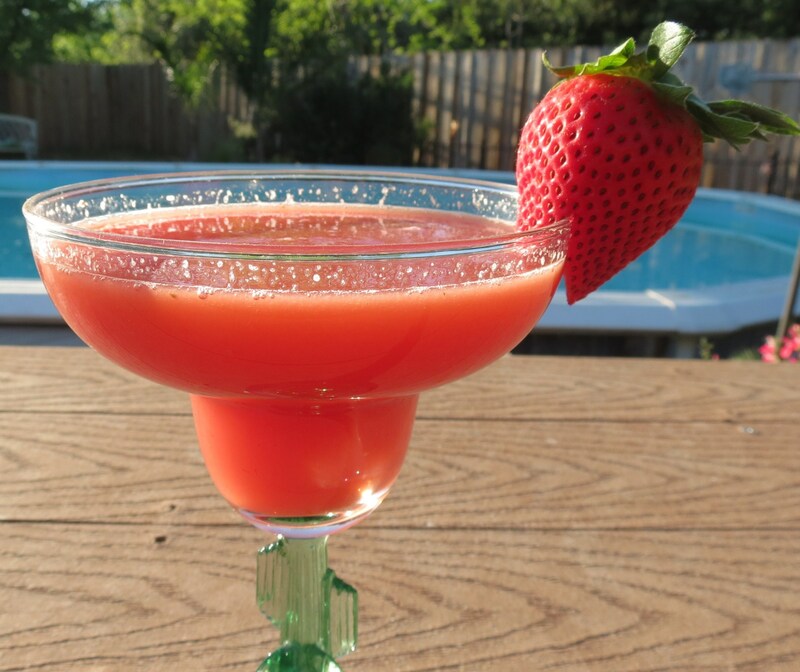 I am making this today-it’s in the 80’s here and this looks like the perfect drink to quench my thirst. Happy Sunday! It’s pretty hot here today. I cranked on the air and kind of avoided the outside, especially since we have a raccoon in the boat, that is as big as my dog. We tried to get rid of him, and he came back. Waiting for Hubby to chase in away. My dog won’t leave him alone!! So I’m staying inside with him! Happy Sunday!! Oh, this looks extremely delicious and refreshing!!! YUM. Thanks Liz! I’m going to make it again today!! I drank the whole pitcher yesterday!! What a refreshing treat from Mother Nature. Happy Earth Day! 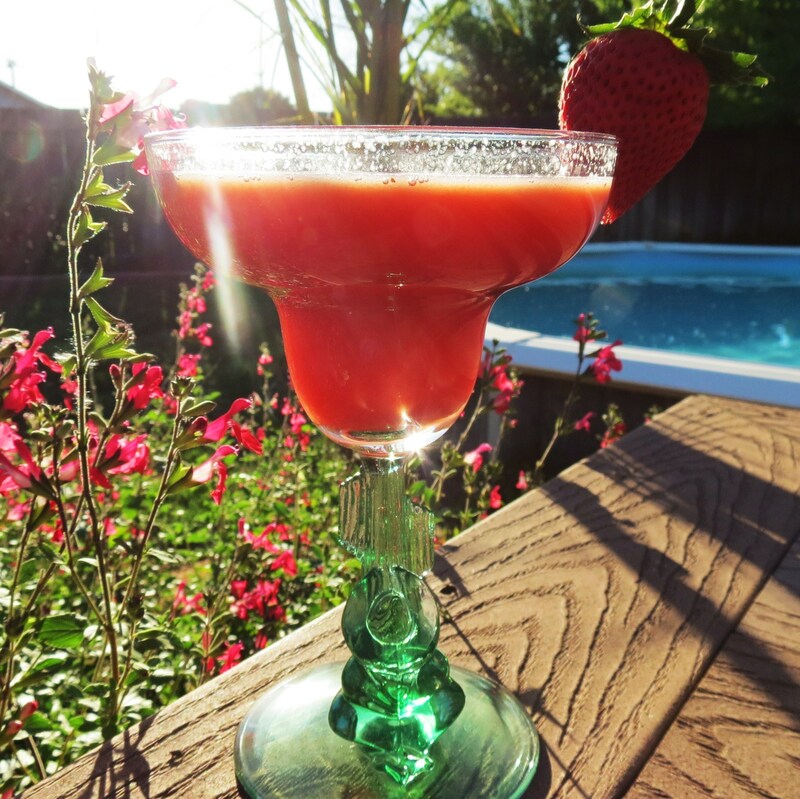 This looks so refreshing and the perfect summer drink! Watermelon, strawberry, and lemonade?? yum!!! 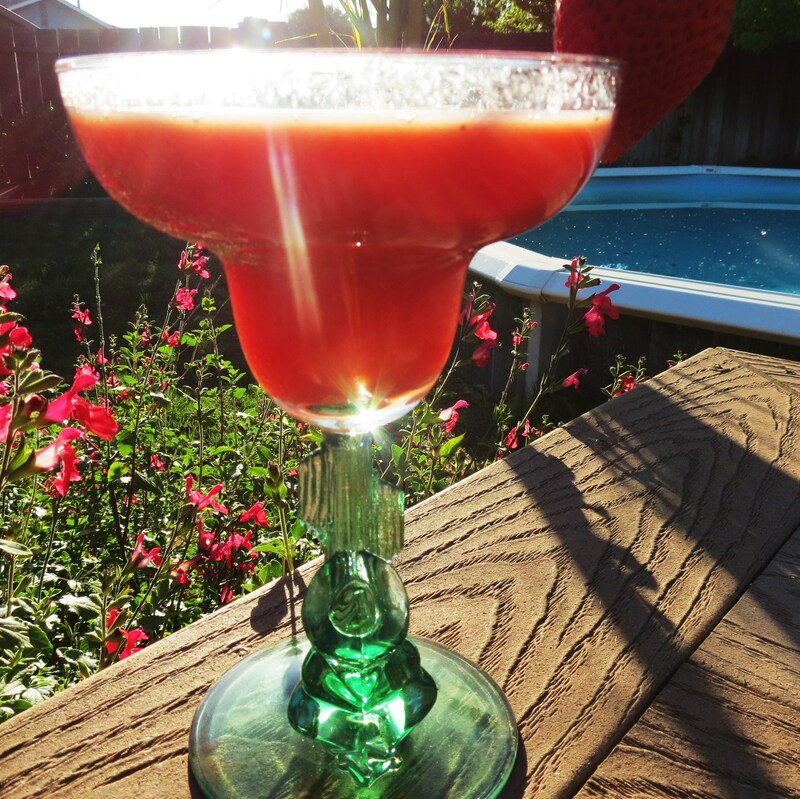 I love it, it really quenches your thirst and is perfect for the summer. Thanks for having me!!! Look forward to next Monday! Watermelon strawberry lemonade YUM! Also a few blueberries on top for added color and flavor. Plus they’re all on sale this week.